Discussion in 'BMX & Dirt Jumping' started by eaterofdog, Feb 4, 2008. 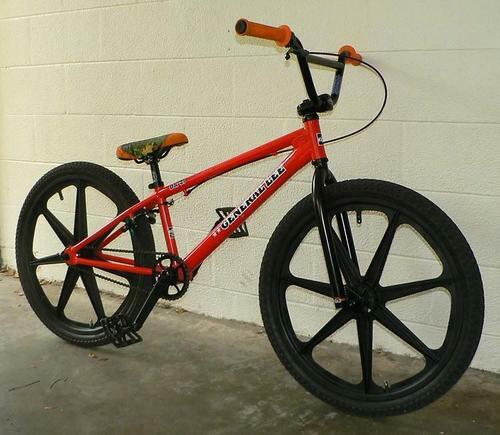 I am looking for some decent 24" bmx wheels. There are not a lot of choices out there. Has anyone used the Skyway 24s? I also have a wavy single wall rim laced to an abused generic unsealed rear hub if anyone is interested. It's not mine. I don't have any experience on them. I do know that they don't come made for a 20mm thru axle. So, he had to modify the hub to work with the 20mm thru on that bike. They come with 3/8 only. The shop will install 14mm axles/bearings for me. No problems there. rumor has it they are heavy as hell. but they look sweet. Looks like they weigh about a pound more than spoked wheels. I can handle that, I am just riding DJs with roll-ins. There sorta flexy also , just a word of warning . Back in the 80's there was a reason for people taking these off their bikes .. weight , lack of good braking and they flex like no other. They still look cool , I have a 24" set on order for a bike I'm building for Disney right now . Found out one of the dudes I ride with is getting some, so I get to check them out first. I really wish Halo SAS MX24's didn't cost $350 to import. Maybe I'll import some Halo hoops and have wheels built. I'm old enough to remember when they were out the first time around... Flexy as hell. Kinda heavy, but basically bulletproof. I much prefer a spoke wheel than a mag. Thank you all for the info. Definitely helps me make a better decision. Skyway uses the H spoke design on the 24s instead of the t spoke. This should make the wheel a little stiffer. There is supposed to be a release of the 24 Graphite series wheel this year. They will be much stiffer. They will probably also be expensive. Bend the wheels on your General all to hell already? Still good but I have been trying some 360s so it's only a matter of time. Well, the newer ones should stiffer than the ooooold ones I had around 20 years ago. New ones have an h cross section to the spokes and the old one had a cross shep. I still would run them. They are heavy and sluggish compared to spokes. And for some reason I could never get the sidepull brakes to work very wee on mine. I did however run them on a few 20" ers back in the day and liked those. They are also a lot wider in the braking surface and you have to open your brakes up quite a bit compared to alloys. I have put in about 15 good DJ sessions on the Skyways and I think they are an excellent deal for the $100 I paid. They are a little heavier than spokes, but due to the relatively small size of the wheel, it doesn't slow the bike down much. I only noticed it a little the first time I rode. The 24s are not too flexy. They will flex if you hit them hard from the side, but they pop right back. As Bryan said, the H spoke design on the 24s seems to have a lot more side to side support than the 20s. No brake problems. Some old timer told me the trick is to never use new pads. Scrub em on concrete or something to break the surface. These things are tough. My buddy 360d onto the front wheel super hard and twisted his fork about 10 degrees and the wheel was not affected at all. edit: I probably wouldn't ride these on 20. 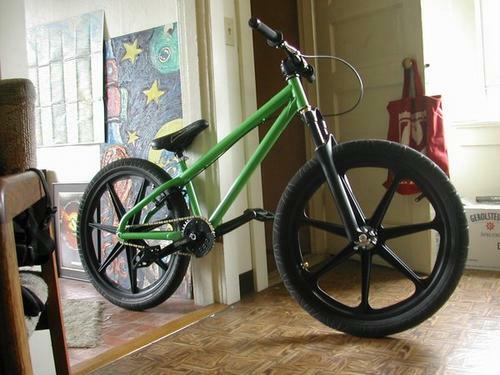 I used to rock some 20" Skyways so many years ago, I remember they were heavy, but forgiving on tough landings. Also you used to be able to buy Skyway brand brake pads specially for them which were not too terrible. Nah, Eater hit it right on the nuggets. Scuff the faces. Hey, just for fun you gotta soak down the brake surface in Coke! It actually worked really well...until the first alley. I think the originals are DuPont Zytel Nylon or something like that.